A Rookie Autographed Patch card is guaranteed in each box. They're numbered to 125 and there are 30 in the set. Randomly inserted are three redemption cards good for all 30 cards. Parallels are numbered to 20 while Spectrum parallels are one-of-ones. Most will agree that the 2014 rookie crop shows more promise than the previous year's. 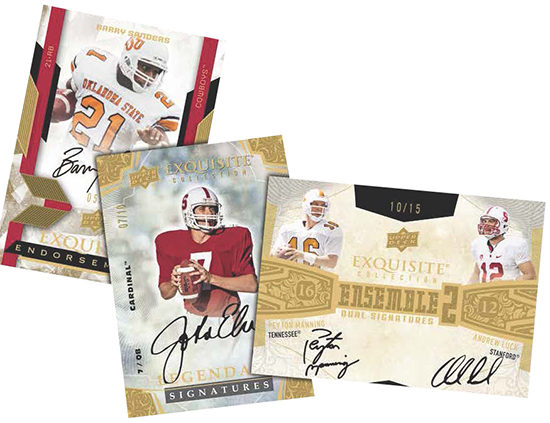 Every box of 2013 Upper Deck Exquisite Football also comes with a 2014 Rookie Autograph. Numbered to 99 copies each, the checklist includes Johnny Manziel, Blake Bortles, Teddy Bridgewater, Sammy Watkins and Mike Evans. Triptych Signature cards are three-panel book cards. These have original painted artwork to compliment the player's signature. Each subject has three cards. Collectors will find three more autographs in a box. These additional hits include Art Signatures (#/15), Dimensions (#/25), Ensemble Dual and Triple Signatures (#/15 or less), Exquisite Endorsements (#/125 or less), Limited Logos (#/10), Rare Materials Signatures (#/5), Rookie Book Marks (#/60) and Rookie Signatures (#/70). The UD Black name returns with Rookie Lustrous Autographs (#/75 or less) and Legendary Lustrous Autographs (#/10 or less). 2013 Upper Deck Exquisite Football base cards are numbered to 70 and have one-of-one parallels. Please note that images are mock-ups. Final cards and product content are subject to change. 2013-14 ud exquisite enshrinements lebron james rc #11 23 OBO. 2013 Brandin Cooks Exquisite Collection Draft Pick RC Auto 9 10 BGS 9!!! Rams!!! 24 Roman Gabriel - North Carolina St.
123 Mike Glennon - North Carolina St.
D-MG Mike Glennon - North Carolina St.
EA-MG Mike Glennon - North Carolina St.
LL-MG Mike Glennon - North Carolina St.
BRL-8 Mike Glennon - North Carolina St.
more UD cards ? I didnt see many Fleer retro or Quantum on Ebay – Dealers not buying UD anymore or what ? If you’re looking at strictly boxes, UD has tight guidelines for selling online. As a result, you don’t see a ton online. william � Thanks. I just double-checked UD’s Facebook page and they still have it as June. With 2014 SPX releasing so close to this product, I wouldn’t be surprised if they delayed it until July. That’s 2 high end products a week apart. One of them isn’t going to do well. Probably SPX. Wish there was a checklist for them. Would love to see what Peyton Manning cards will be in the sets. Cards look sweet. Need a checklist so I know what to look for my P.C. 2013 Exquisite Factory Sealed Football Hobby Box Le'Veon Bell AUTO RC ? ?